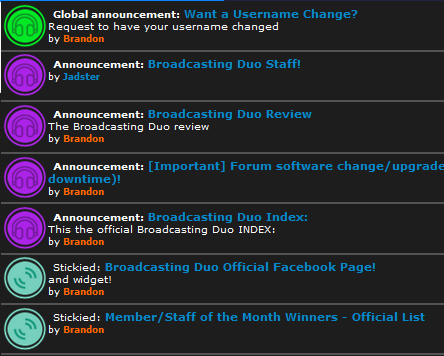 We are pleased to announce that Broadcasting Duo now has brand new post legend icons (new post, no post, stickied, locked, etc). The new ones are way more modern looking than than the old ones and help make the forum look much nicer. Special thanks to @Skouliki for making these wonderful icons for us. 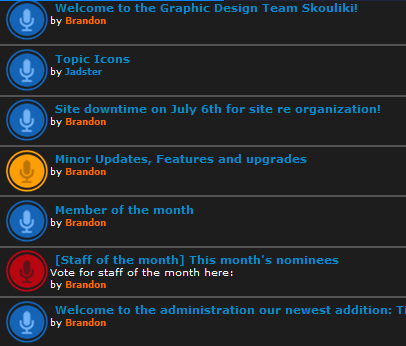 We hope everyone likes the new icons and will view them as an improvement to the site. P.s Keep your eyes peeled to this section over the next couple months, as there are plenty more great improvements to come VERY SOON. Re: New post legend icons! well, the old icons served us for a long time. @1mtvfan wrote: well, the old icons served us for a long time. They did, but change is good. The new ones look way better than the old ones. The new icons look great. I would say it's definitely an improvement. Pardon my tardiness in relation to this thread but I agree that the new icons look fantastic.